Today’s update is focused about getting radians to display in the user interface. It had me stumped for a while how to get the degrees symbol to appear and to show the radian value, initially I though all you need is to pass the PROP_EULER subtype when defining the property. The cap variables where still shorts – who really needs to cap rotation at 59.14 degree? But no dice. To get it working I needed to change the caps to floats, which I guess makes sense when dealing with Euler values. 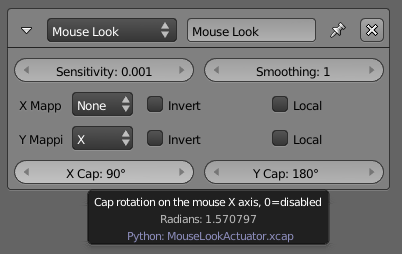 The other advantage is that the conversion from degrees to radians is all handled as part of the interface, so I don’t need to do it as part of the actuators code. And while I was messing around in rna_actuator.c I made a few other improvements to the struct’s interface, such as step sizes and what not. ~ by Jay on May 2, 2012.